Thanks to the folks at GoCertify.com, I had a chance to peruse the “Digital Leaders Survey” for 2014 compiled by the BCS aka The Chartered Institute for IT. Based in London, this group’s report includes a pool of respondents from around the globe, but over 4 out of 5 of them reside in the United Kingdom. The results of this survey are quite interesting nevertheless. Surveying IT trends and issues from a mix of mostly British firms from around the globe produces some interesting results. 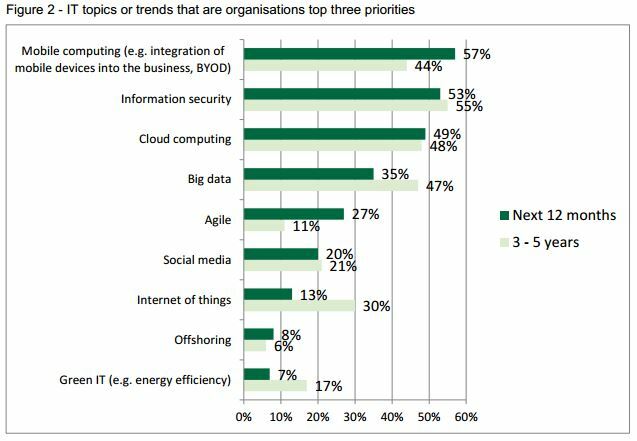 Other items on the IT radar at the companies surveyed included Big Data (35% down from 47% further out), agile development (27% up from 11% further out), social media (20% down slightly from 21% further out), the Internet of Things (13%, down significantly from 30% further out, as you’d expect), offshoring (6% down from 8% further out), and Green IT (further explained as “energy efficiency”; at 7% down from 17% looking 3-5 years out). Mobile computing drops to fourth place in the more forward-looking lineup, at 44%. Both the Internet of Things (which jumps from 13% near-term to 30% further out) and green IT (moving from 7% near-term to 17% further out) show the biggest projected increases when the time horizon expands. The same survey also showed a need for enhanced IT skills among the existing workforce from over half the respondents (57%), a need for additional, suitably qualified IT staff (48%), and increased IT budgets (37%) as the top three gaps in need of closing so as to “address the management issues and IT trends your organization has prioritized.” No surprises there, perhaps, though these items do validate the potential utility of high-demand IT certifications, especially in identified “hot areas” — namely, mobile computing, information security, cloud computing and Big Data. Be sure to check this survey out for yourself. It’s definitely worth a look-see.